Creating remarkable campaign involves lots of efforts and minimum investment, if you are trying it over 3.5X2.5 oval magnets. Do you know why? Because you can explore and experiment with your creativity without overshooting your budget! Magnet advertising allows you to experiment and bring out the best in your campaigns. This blog discusses about taking threes step journey to a remarkable branding campaign. Impressive design is the key to winning campaigns. Full color printing offered by many online eCommerce stores has aided marketers to create campaigns, which are eyeball rollers. Use brilliant visuals, logos, fonts and themes, which synchronize with your product and bring out the best in your product. Good design is a promise in itself. It actually says- we are with you. This compels people to retain your advertisement over their refrigerator doors or working cabinets as long as they wish without second thoughts. After working on design, try to present information, which directly affects their consciousness. Create engaging advertisements over 3.5 x 2.5 oval magnets because they are the real revenue earners. You can hit their minds saying what they can expect from this purchase and how they are saving on investments without compromising on the quantity or quality. Create compelling sentences that directly hits their consciousness. For example – You can play around with sensory and emotional words such as soft, hard, tough, silky, durable, lasting, smooth, etc. Perhaps you can take cue from many of those shampoo advertisements, which sound such as silky hair at lowest price, complete hair nutrition from the root, etc. After rocking their consciousness, try to land your campaign at the center of their heart. Prick their emotions by using hearty words or stories. You can adopt the pizza model of marketing to position your campaign deep into their hearts. Have you forgotten those advertisements, which showed creamy pizza pieces melting right in the mouth? Create an impulse by producing hearty campaigns, which influence buyers to order straight away without bothering about their purse strings. 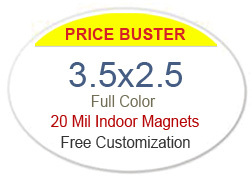 As said above an indulgence with oval magnets 3.5 x 2.5 is not only financially beneficial, but also empowers you with ability to create impressions on minds of your prospective customers. You can explore emotional and human sounding advertisements on different types of made in USA promotional magnets. Full color promotional magnets make a great replacement for traditional paper marketing items and they can be combined with various other contemporary digital strategies for best results. You can position your brand before customers by handing out full color personalized oval magnets 3.5 X2.5 during tradeshows and other promotional events.